John Waters' annual Top Ten films of the year for ARTFORUM has been published. Top honors for 2014 goes to MAPS TO THE STARS by David Cronenberg. Did your favorite movie of the year make the list? Yo, NOLA! 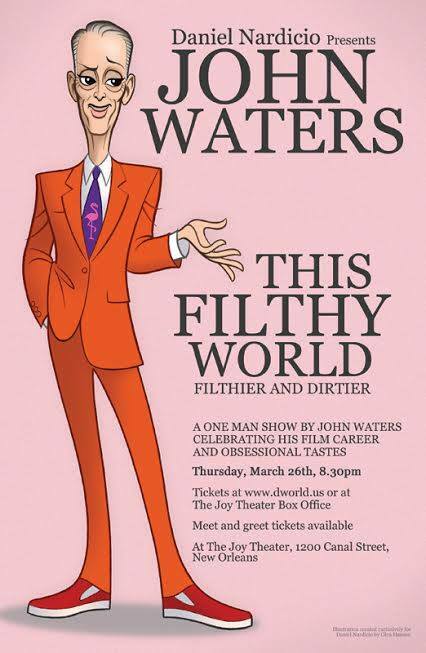 John Waters is coming your way in March - performing THIS FILTHY WORLD on the 26th at the Joy Theater. Currently on tour in the UK, Mr. Waters recently did an online Q&A with the Guardian. And his responses to participats questions are hilarious, of course! Lot's of news to report today, Dreamlanders! 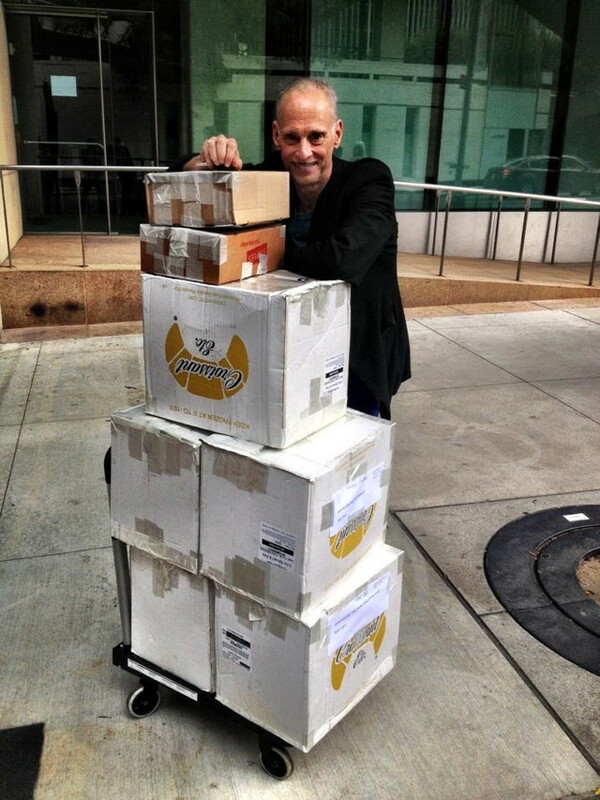 First off, if you're in Cincinnati, John Waters will be appearing TONITE! He'll be performing THIS FILTHY WORLD at Memorial Hall as part of the opening-week programming of the FotoFocus Biennial. 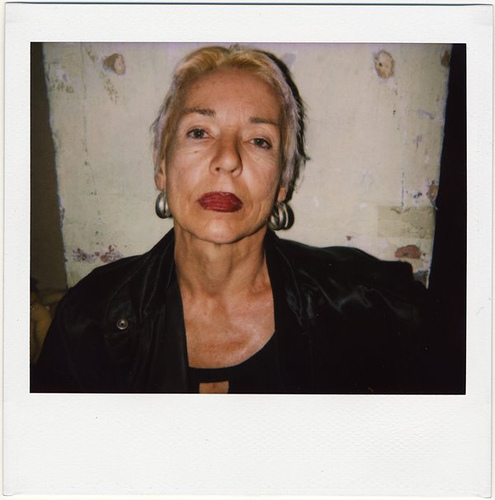 And his photograph "Inga #3 (1994)" is part of a FotoFocus exhibition. Next week, on the 14th, he'll be at the Hoyt Sherman Place Theatre in Des Moines, Iowa giving a speech called: "Warhol and Waters: Fame and Filth" in conjunction with the exhibition at the Des Moines Art Center called "Halston and Warhol: Silver and Suede". And on Saturday, October 18, John will be performing THIS FILTHY WORLD as part of a fundraiser at Basilica Hudson in Hudson NY - and doing a book signing earlier in the day at FINCH. 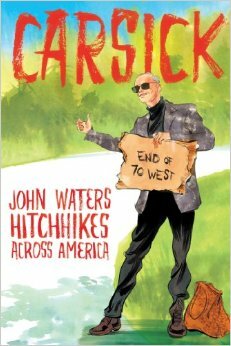 CARSICK will soon be published in the UK by Constable, Robinson & Corsair, and to celebrate the release, Mr. Waters will be performing in London, Manchester and Glasgow during November! CARSICK is also being published in Spanish by Caja Negra, and will be released in Argentina and Spain in November. Susan Lowe, who played Mole McHenry in Desperate Living, among many other legendary Dreamland roles, has recently published an Etsy page where you can browse and purchase some of her original artwork. Way to go Susan! And finally, there are two new books to pick up. 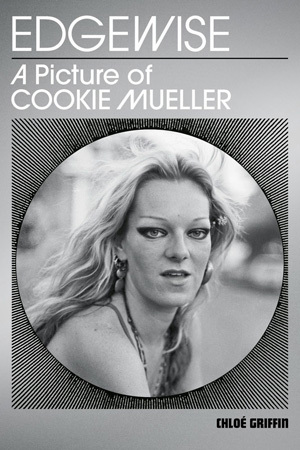 First up is a new biography of Dreamland star Cookie Mueller. Edgewise: A Picture of Cookie Mueller tells Cookie's story through an oral history composed of interviews with the people who knew her best, including John Waters, Mink Stole, Gary Indiana, Sharon Niesp, Max Mueller, Linda Yablonsky, Richard Hell, Amos Poe and Raymond Foye. 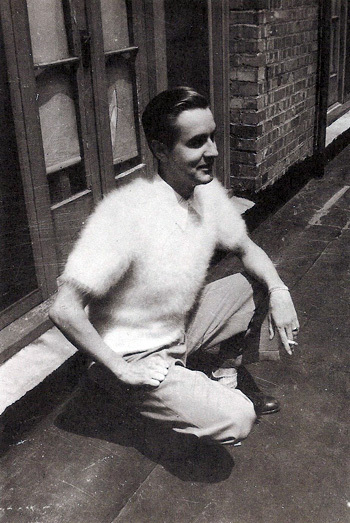 And this year would have been Ed Wood's 90th birthday! 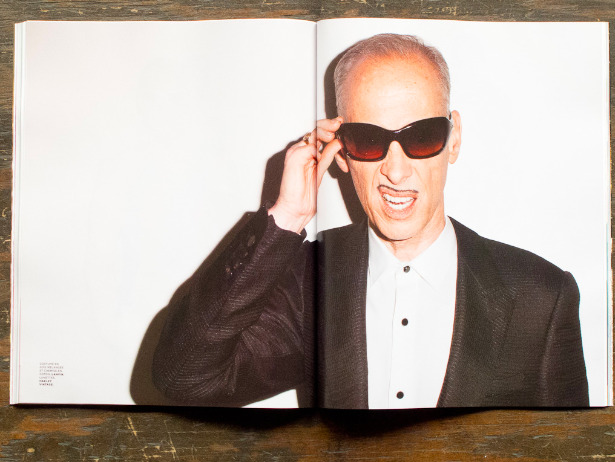 There's a new book of 32 unpublished short stories by the legendary director, one of John Waters' biggest influences. 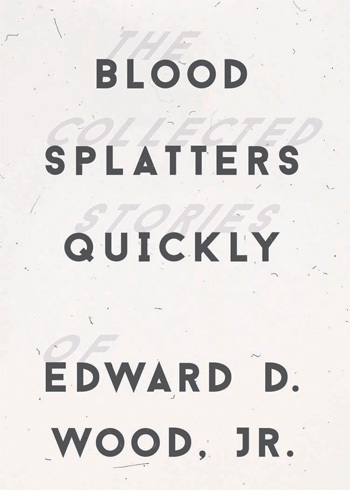 Blood Splatters Quickly collects stories that originally appeared in short-lived "girly" magazines in the 1970s, before his untimely death in 1978. LONG LIVE ED WOOD! 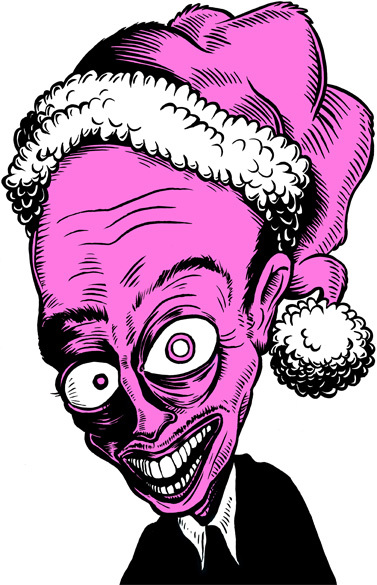 John Waters has announced dates for his annual Christmas tour! Sorry I don't have specifics on venues and on-sale dates, so check your local listings! Hey AUSTRALIA! Starting tonite, and running all week, is a marathon of bad taste! The Film Society of Lincoln Center is hosting a complete retrospective of Mr. Waters work. COMPLETE. That's right, even the earliest of films like ROMAN CANDLES, HAG IN A BLACK LEATHER JACKET and EAT YOUR MAKEUP will be screened. This is not to be missed! Tickets to the festival, lovingly called Fifty Years of John Waters: How Much Can You Take?, go on sale in a couple weeks. In the meantime, the full schedule is posted so you can start planning! The festival will run concurrent with a series selected by Mr. Waters called Movies I'm Jealous I Didn't Make. 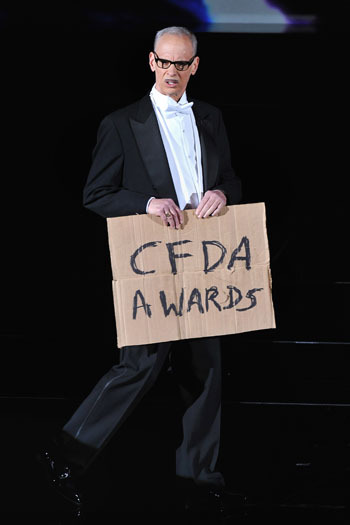 Last night, John Waters hosted the prestigious Council of Fashion Designers Awards (CFDA) in New York at Alice Tully Hall in Lincoln Center. And he did not shy away from his usual wit and sharp tongue. I'm sure he ruffled some feathers, and not just the ones attached to ridiculous, overpriced gowns. And if you haven't picked up a copy of the new book yet, you can get one at any of the events above, or from your local book shop. If you don't have a local book shop anymore, here's a link to purchase on Amazon. The one and only Mink Stole is participating in "The Naked Eye," a benefit auction for MIX NYC, the non-profit that runs the annual New York Queer Film Festival. Along with 149 other celebs, Mink was given a disposable camera and asked to take every photo on the roll, and autograph the camera. The results are left undeveloped in the camera, so the winning bidder gets to take the film in and see what develops - literally! And while we're on the topic of Mink, she'll be appearing at a screening of POLYESTER on June 21 at Pittsburgh's Hollywood Theater, complete with Odorama cards and an optional meet-and-greet with the star herself. And finally, if you're in P-Town this summer, John will be performing THIS FILTHY WORLD at Provincetown Town Hall on July 14. And it will double as a book signing / meet and greet. Tickets are already on sale! If you live in the UK, good news! Tickets are now on sale for a performance of THIS FILTHY WORLD at the Southbank Centre in London in November. This performance will be followed by a signing for his new book CARSICK. If you live in the Baltimore area, check out the Maryland Film Festival, running from May 7-11. John Waters will be presenting the film Abuse of Weakness, by director Catherine Breillat on May 9. The story centers around a filmmaker who suffers a stroke and, as she is recovering, starts a relationship with a known hustler. Sounds charming! Click here for more info on the festival. The documentary I AM DIVINE is out on home video. Featuring interviews with John Waters, Ricki Lake, Tab Hunters, Mink Stole and more! Plus 30 minutes of extra footage than the theatrical version. John Waters will be performing THIS FILTHY WORLD in the Dallas area on May 29th at Wordspace, a non-profit literary organization. If you haven't caught it yet, John Waters was the guest on an episode of RuPauls' web series RuPaul Drives! On their way to the book store, they chat about John's new book "Carsick," his love for Howdy Doody and lots more packed into a short car ride. Tonight, John will be talking with legendary artist Jeff Koons in Los Angeles, and although the tickets are sold out, the event will be streaming live for your viewing pleasure at 7:30pm PT. Hey kids! As of today, I'm finally publishing Dreamland News updates to FACEBOOK. Better late than never, right? Please visit our new page and give us a LIKE! I'll continue to publish news to this page as well, but I think Facebook is a great opportunity get news in your social feed, and for fans to connect with each other, rather than relying on this site to do that. I'll still be happy to highlight out of the ordinary fans, so if you'd like to be one of the few, the featured, please visit this page and send me a submission. The page is in it's infancy for now, so when you visit, post a word or two to get things started. And over the next year, I'll build it out with more content and features as we go. Happy New Year, Dreamlanders! Or should I say Frohes Neues Jahr? Check your local listings for ticket and venue information! DreamlandNews © 2014 Jeff Jackson. Got news? Email me!